Minnows France stunned Olympic champions Argentina 5-3 to cause the biggest upset of the tournament in their must-win last Pool A match and book a place in the knockout stage of the men's Hockey World Cup. France ended their pool engagements at the second spot behind toppers Argentina (6 points) on four points on account of a better goal difference than New Zealand (4 points). France secured the second spot with a goal difference of +1 as against New Zealand's -2 (minus 2). Spain will have to pack their bags and leave as they have been eliminated from the tournament. In the last Pool A match, France scored four field goals through Hugo Genestet (18th minute), Aristide Coisne (26th), Gaspard Baumgarten (30th) and Francois Goyet (54th), while the other goal came from a penalty corner conversion by skipper Victor Charlet (23rd). World no. 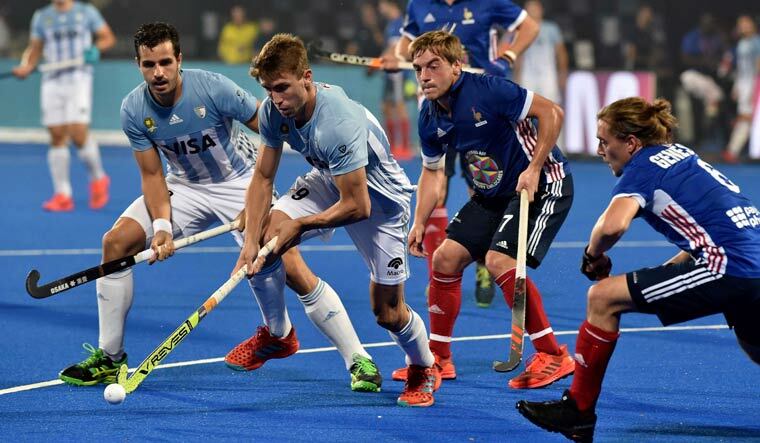 2 Argentina's goals came from the sticks of Lucas Martinez (28th) and two penalty corner strikes from Gonzalo Peillat (44th, 48th). Earlier, New Zealand fought back two goals down to hold Spain to a 2-2 draw in their penultimate Pool A match and qualify for the knockout stages.